We started with half the group on Ouija, and the other half on Table Tipping. We had slight movement on both. We then tried the Human Pendulum and had the spirit of a male soldier step forward. He had passed in his 20’s from a head injury. His wife was also with us. One of the guests had his name as Archibald. He had murdered someone, for stealing his money. He was happily married, who then stepped forward, her name was Elizabeth. We did try the table tipping again and had a lot of rocking but no more. We then used the dowsing rods & pendulums, and guests enjoyed exploring and communicating with the spirits. With my second group again we started with table tipping and had some rocking, one more than another with a lot of spins, rocking and walking across the room to where the spirit was standing, after hearing noises from that area. We then all tried the very large table and was able to get a lot of movement, rocking rapidly, tipping up and holding to one side when asked. Two guests at one end of the table both had blowing in their ears at the same time. Jenny (guest) kept feeling like someone was pulling on her trousers. We tried the Ouija and had the spirit of Edgar, from 1943 aged 23. He was pushed down the stairs here in this room and died of a head injury. The man that pushed him was having an affair with his wife. People have experienced being pushed on these stairs. Was this the reason why? His wife Charlotte who was a nurse, had tried to make him better. Others were using the rods & pendulums to communicate with the spirits, a male spirit confirmed he was the one that had moved the large table. With my last group we had a little movement on the Ouija & table tipping, but not enough to communicate. Tried the large table and had some gently rocking. Used the rods & pendulums for a short while, but everyone wanted to try the human pendulum. We had a spirit come through that had known Mark (guest). He was able to communicate with him. In the free session I joined Mark and his family in the Salle Port, we started with table tipping and had some slight movement. We then switched to glass work, and with a yes & no established communicated with the spirit with us. We were hearing noises around us, and did hear and feel a breath. A great night at Fort Amherst again! Fort Amherst is one of our favourite venues as there is never a dull moment during the event. 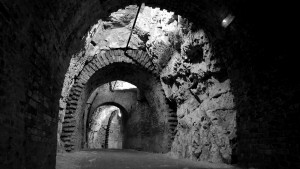 It is also one of the spookiest as long tunnels and underground rooms often are. During the séance sessions that I held we were joined by a spirit called Christopher who was aged in his late 30s and an Army Sergeant from the Second World War era. Whilst Christopher was able to push and manipulate people we also heard a lot of strange noises, doors banging and footsteps. This was all very odd as there wasn’t a slight breeze outside let alone a strong wind to slam a door. During the final séance session many of the group, including me had numb or tingling toes. What this meant or what it was supposed to mean is unknown, maybe we’ll find out on a return visit to Fort Amherst later this year. 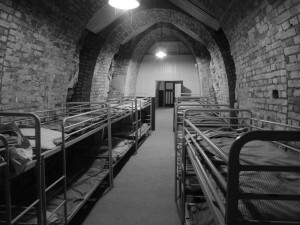 This was another excellent ghost hunt at the Fort with lots of paranormal activity felt and experienced by the guests. The first group experienced Thomas (spirit) downstairs who pushed some of the guests, upstairs there was a Captain and a Sergeant who seemed to only make noises (footsteps) upstairs when we were downstairs. Odd smells were smelt by many including some very unpleasant ones. Hot and cold spots were also detected but it was a windy cold night in Chatham. The second group didn’t feel the same spirit energy as the first group, mainly because no one really asked for anything or even spoke. There were a few odd smells again but they were not as strong as the first group session. The third group experienced lots of movement in the séance including pushing and pulling of different people and everyone experienced their arms being moved in some way or spirit pushing down on their shoulders. There were two spirits with us at the time George; a key holder to the building and Thomas who I met with the first group who said that he wanted to talk, although I have no idea what was meant by this statement as he didn’t say anything. This was another excellent ghost hunt and as ever we look forward to returning later in the year. We had kept all the guests together for this event as the numbers were low enough, therefore I only had one controlled session. My first guest in the middle was Nina, and the spirit we were communicating with was a male in his thirties. He had murdered someone, over a woman. He had children but had not married. The second guest in the middle was Dean, and we had a female spirit, who was the daughter of the previous spirit. Then we had a female friend of the daughter. The last spirit to come through was connected to one of the guests called Sharon, she was an Aunt who had passed away just a short time ago. Sharon was thrilled to have her come through, and although this isn’t normal for spirits we know to come through, she obviously need to receive that message. 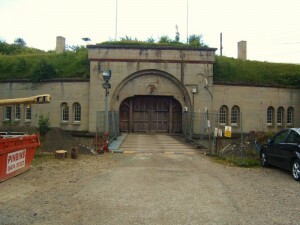 Given that we have investigated Fort Horsted a great number of times over the last four years, I have never held a séance in the hanging room. Strange really because the Hanging room is known for its paranormal activity and why it is called the hanging room. Having just two groups but three team member sessions meant that each team member had one session off and could join another session or investigate on their own. Both groups in the Hanging room felt the spirit called Damien who was aged in his early 20s, quite a happy person who was a soldier from the Second World War. In the first group Craig felt angry for no obvious reason although he said that it made him feel that he wanted to hurt someone. Steve also became affected and felt sick and unwell. Other guests felt the spirit lift their arms and push them gentle forwards and backwards. The second group had lots of movement in this room, with Damien exercising his spiritual muscles so to speak, with people being pushed against the walls and being dragged by their arms to the floor. There was also lots of arm movement and gesturing of cutting someone’s throat, although the reason for this wasn’t explained by the spirit. Half the group were twisted and pushed together leaving the other half puzzled as to why they hadn’t been moved. There are many reasons why some people don’t get touched or moved but by far is resisting the spiritual movement, not being relaxed and not encouraging the spirit to do something. Standing in silence is not encouraging to the spirit.